Athens has a peculiar reputation: on the one hand, it’s the “cradle of Western civilization”; on the other, it’s the capital of the enduring Southern European financial crisis. For many visitors, it’s good for little more than a one-day sightseeing break before heading out to the islands. But Athens can be so much more, and as with every complicated relationship, it can take some time to give way to first impressions and really take in what makes it stand out. Join me as I explore Athens, my hometown. From the plethora of options, when it comes to Athens hotels that stand above the rest, two options come to mind. AthenStyle in Monastiraki is definitely a highlight. In a great location tucked away in the streets branching out of Monastiraki, and sporting one of the cosiest rooftop bars in the city, this “luxury hostel” – as they call themselves – is an ideal option for a medium budget and the more relaxed traveller. In fact, I often drop by the aforementioned bar for their happy hour. Stepping up the quality, Coco-mat is one of the most successful Greek businesses. Founded in 1989, its mission statement is to offer “blissful sleep to every person who sleeps on our beds, our pillows and our mattresses”. A few years ago they branched out into hospitality, so you can imagine that electing to stay over at one of their Athens hotels is a delightfully restful experience. Their 4-star premises in Kolonaki – one of the city’s oldest and most high-end neighbourhoods – brings together Greek style and flair in their newly-renovated building originating from 1935, alongside practical comfort. N.B. There are plenty of other options of course, but one important point to remember is that central is not always best. The centre of Athens has many neighbourhoods that some locals consider dodgy or dangerous, especially around Omonoia Square after dark – this might explain why some of the prices here are so low. One of my favourite things to do in Athens is to just walk around the Old Town – indeed, alongside the tourists. The whole city and its multiple hills are ripe for exploration and viewpoint-hunting, but I can never get enough of the little streets around Anafiotika that make me forget I’m even in a city. Moving on next to Areios Pagos or the quieter Pnyx – ancient rocks which held special, historical significance in Ancient Athens, and are now some of the most-frequented hotspots below or across the Akropolis. These are some of the best vantage points above the awe-inspiring, slightly overwhelming urban sprawl of the modern city, and the most famous symbol of Athens: the Parthenon. 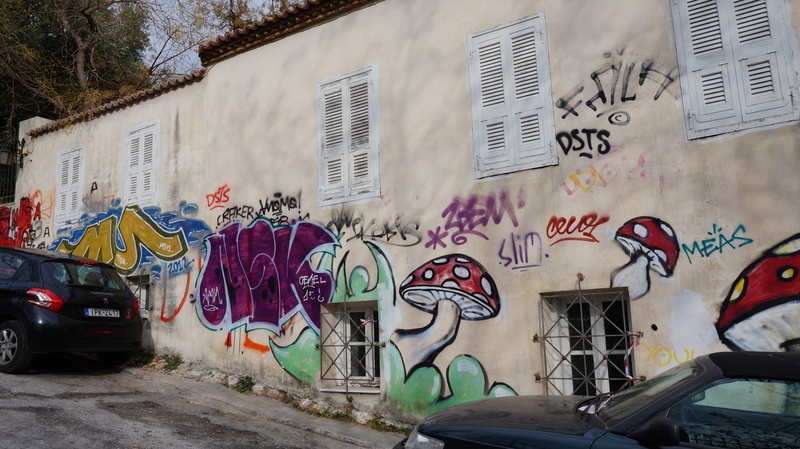 One of the results of the crisis is that Athens has been transformed into a hotbed of street art. It doesn’t take long for many visitors to note the graffiti on almost every building, the quality of which ranges from simple tagging, illegible scribbling and vandalism, to masterful works of art. The obvious choice for mural hunting is the anarchist neighbourhood Exarchia, but you should definitely also check out the areas around Pireos St, including Palamidou St where you can find the mural dedicated to the memory of Loukanikos, the dog who became the mascot of the Aganaktismenoi (Greek Indignados movement). Really, when it comes to street art in Athens, you should just follow your nose. The hottest new arrival in Athens at the moment is the jaw-dropping SNFCC – the Stavros Niarchos Foundation Cultural Center. It’s a huge Mediterranean park that has been hosting free events such as concerts, World Cup match screenings, film screenings, activities for families and children, seminars, and so much more. The main monolithic building itself was designed by architect, Renzo Piano, to house the National Opera and the National Library of Greece, but its cultural impact has spread much farther. It sits on the coastline – which is worth exploring regardless – and is just a few hundred meters from Plateia Nerou, one of the best open-air music festival scenes in the city. At first glance, the area might look like it’s far away from the centre, but SNFCC has taken care to provide regular free bus rides from the centre of Athens to the premises. Back in the centre, and one of the favourite pastimes of us Athenians when the weather is warm is to go to the cinema under the stars. Lucky for us, there are loads of them around the centre. You can find them on rooftops, in gardens, even with a view onto the Acropolis (at famous Cine Thisio or Cine Paris), and in every neighbourhood in Athens if you choose to do some exploring on your own. The Athens Open Air Film Festival, with its variable screening locations, is another great option for more classic films, with free admission for every screening. Athens is, of course, most famous for its ancient history, and the New Acropolis and Archaeological museums are the obvious choices. But the high admission price, hordes of visitors, and very specific themes mean I would encourage you not to visit those museums, unless you’re really specifically interested in Ancient Greek history. Instead, I would like to suggest you pay a visit to the Herakleidon Museum and its art, science and mathematics exhibits (their current flagship exhibition is on Ancient Chinese science & technology). I still can’t forget my first time there and how awestruck I was at my first real exposure to M.C. Escher. Greece has a very particular coffee culture and Athens is no exception – we really make a great freddo espresso/cappuccino (if you don’t know what that is, you’ve just taken your first step into a larger world). Ingesting our liquid caffeine is serious, lengthy business, so choosing the right place is as important as the drink itself. Yes, we like to take our sweet, sweet time with coffee. I can recommend at least two places; Black Duck for its splendid, secret garden that is like a breath of fresh air, even on the hottest days, and Little Tree for its terrace in the shadow of the aforementioned New Acropolis Museum – if you choose to skip going inside the museum, you may instead opt to get a freddo espresso and enjoy reading a book on the cosy, sunny terrace, or on a comfortable sofa inside among the bookshelves. Now that was easy, wasn’t it? The nightlife in Athens is legendary – few other cities have goings-on as vibrant and alive at night as during the day, and many of the places that offer coffee in Athens also double as decent bars to have a beer after dark. Then there are those that take the extra step. My favourite spot in Athens is Syntrimmi. This cafe/bar/meze restaurant in central Thisseio is a snug co-op that’s taken over a century-old renovated building. It’s incredibly cheap for top-quality organic draft wine and Athenian craft beer, making it a go-to spot in the city. I’d suggest trying to catch the Rembetiko band on Thursday evenings. Blackbird is a fine choice in Exarchia for its Rolling Stone-inspired decoration and ever-vibrant atmosphere. Hitchcocktales makes juicy, Hitchcock-inspired cocktails in tiki statues on a quiet side street just 50 meters from the Acropolis metro station. Melanthiou Street is perfect to catch the very particular, urban nightlife vibe of Psyrri, outside hipster bike bar Handlebar. And that’s just for starters… making a full list could be a whole article in itself. Oh, did I say starters? Greek cuisine needs few introductions, so let’s skip them. As a vegetarian (or, ahem, flexitarian), I have lost touch with the best places to have a really good meat souvlaki or burger. Still, I can heartily recommend the ultimate local secret, in an office building canteen on Syntagma Square. At Biftekares you can choose from a small variety of simple, delicious dishes and enjoy with great views. Avli is another hidden restaurant, though not quite as obscure. This one is more of a place to imagine what Greece must have looked like in the “austere but sincere” ‘60s while enjoying some genuine Greek salad – or as we call it here, ‘village salad’. If street food is more up your alley, Guarantee in increasingly hip Koukaki will definitely grab your attention, with a wide selection of fillings for the most delicious sandwiches. Without straying too far from the area, you can get a ‘boiled greens variety’ (which is so much more colourful than it sounds) at tiny, inconspicuous Koutoukaki. Finally, for the full local experience and the best-fried cod with skordalia (garlic dip), don’t miss Leloudas, a tavern dating back to 1928 with tons of history. Please note that these are mostly low-key restaurants and eating spots; I don’t have a lot of experience with higher-end restaurants in Athens, so if you’re into finer dining, you’ll have to explore this yourself – or seek advice elsewhere! Shopping for souvenirs, trinkets and more can be really fun in Athens, as the best shops combine innovative Greek design with quality items you won’t be too ashamed to keep lying around. Two such shops you can head over to for that purpose are Forget Me Not and Flaneur in Plaka, both with exquisite taste and lovely people. They’re in the most touristic part of the city, but don’t be fooled – they’re light years ahead of the competition. Another shop I really like is Booktique in Kolonaki. It’s mainly a bookshop, but has many graphic-design and Greek typography-oriented gifts, and a good selection of books in English. Finally, don’t miss a chance to visit Graffito, a concept store that combines coffee, healthy snacks and Greek products of every kind, including furniture, decor, fashion, gifts and a lot more. This post was brought to you in collaboration with Spotted by Locals, an app and website which publishes guides to cities around the world full of local spots recommended by locals. We love the idea of it and can’t wait to use it on our next trip. They currently have guides to over 70 cities around the world, so go and take a look and see if they have a guide to your next destination. Dimitris Hall is the editor of Spotted by Locals, city guides featuring insider tips by locals in nearly 70 cities around the world. Half-Greek, half-Australian and an Athens insider (“Spotter”) himself, he enjoys writing about local travel, sustainability and where culture, nature and technology meet. Thank you so much for sharing this wonderful information. I needed that kind of tips that you shared in your article.